All right, here we go, more new painted figures from the Island of Blood. 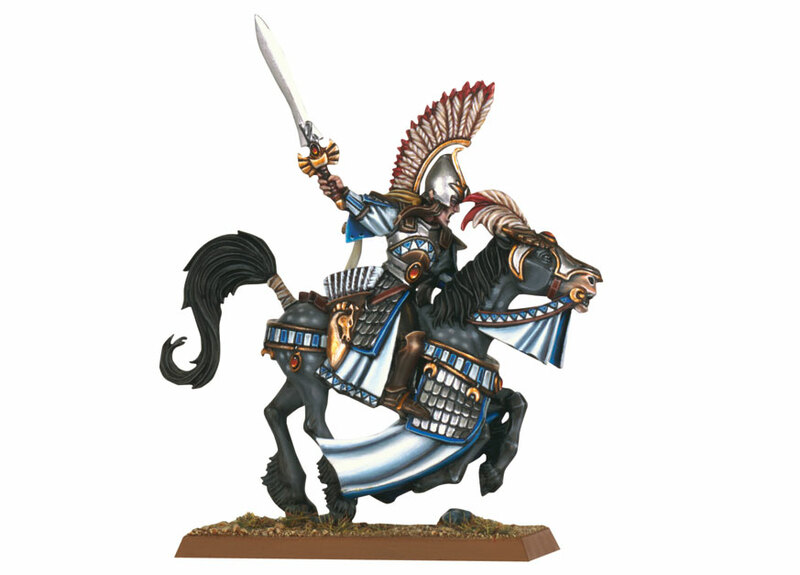 Ellyrian Reaver Champion – Eltheus Farsight leads his unit of Ellyrian Reavers, the Dawn Riders, in daring raids against the enemy’s flanks. 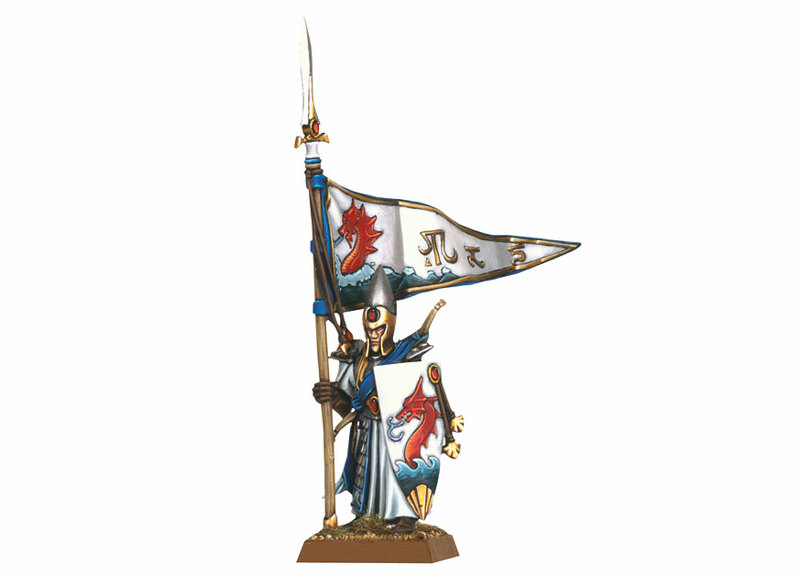 Lothern Sea Guard Standard Bearer – the elven runes, waves and sea dragon are actually sculpted onto the Sea Guard’s banner. If these High Elves Horses are an example of the new horse models to come, I will be really pleased and excited! 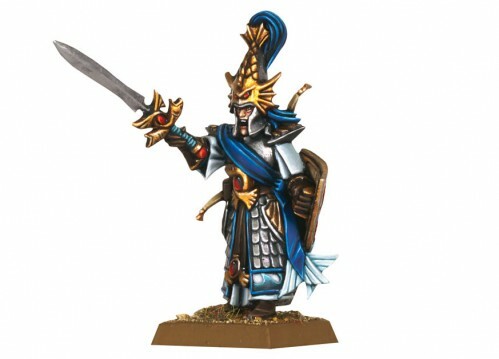 Hoping really for a plastic Dragon Princes/Silver Helms combo set now. What just happened here? Ok, the release of the High Elves Island of Blood models were all going so well with the Griffin and all, when suddenly we are hit with this! A vampire looking mage with a fountain pen on his head, and a stunted looking Lothern Seaguard champion with 70’s retro horror movie merman helmet? Or better still, a fish on his head? 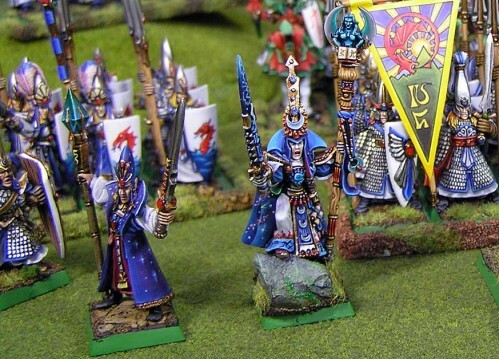 More Island of Blood High Elves Models! 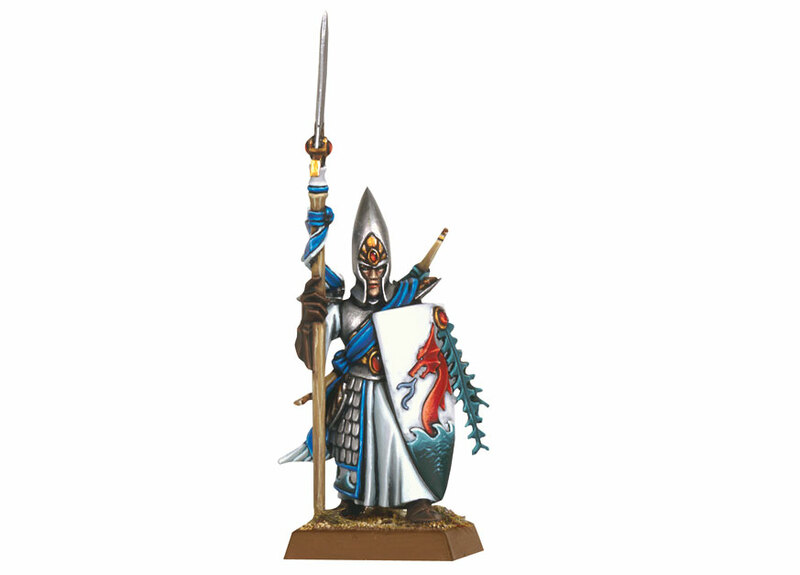 We have more Island of Blood High Elves miniatures for you! Check out the ‘Eavy Metal Team’s fully painted High Elves Noble on Griffin and another Lothern Sea Guard. 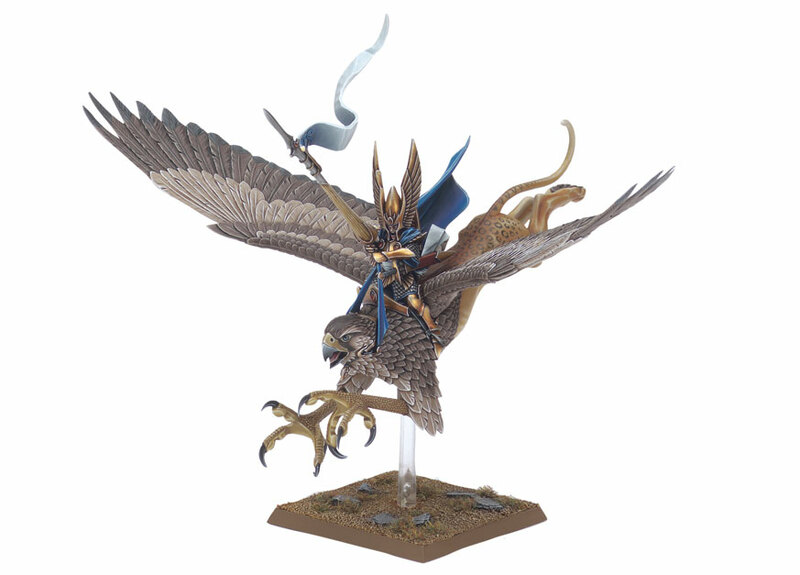 This Noble on Griffin has to be one of my favorite High Elves character models of all time! Just BEAUTIFUL! Check out this awesome Lothern Sea Guard musician from the Island of Blood boxset painted by ‘Eavy Metal team. That is a really sweet model and a fantastic paint job to boot! Q. 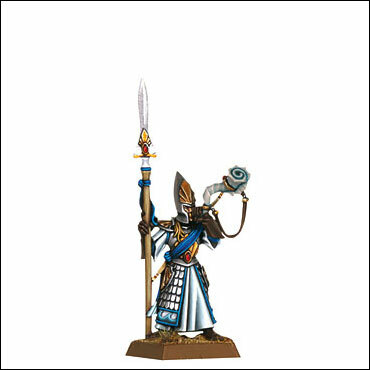 What miniatures do you get in The Island of Blood box? a Skaven Poisoned Wind Mortar. Wait a minute, there are just not enough Elves! 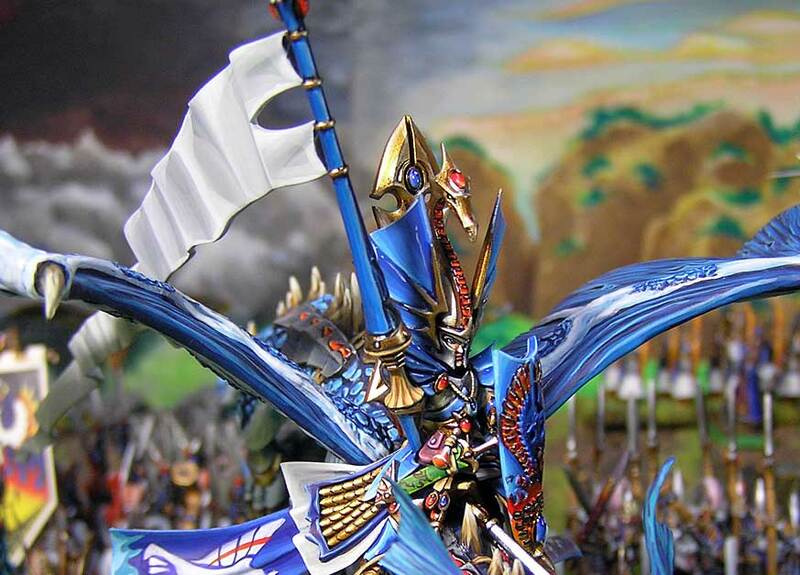 Ryogo Yamane, from Japan, shares with Games Workshop his awesome painted army. Check out his other painted figures here. 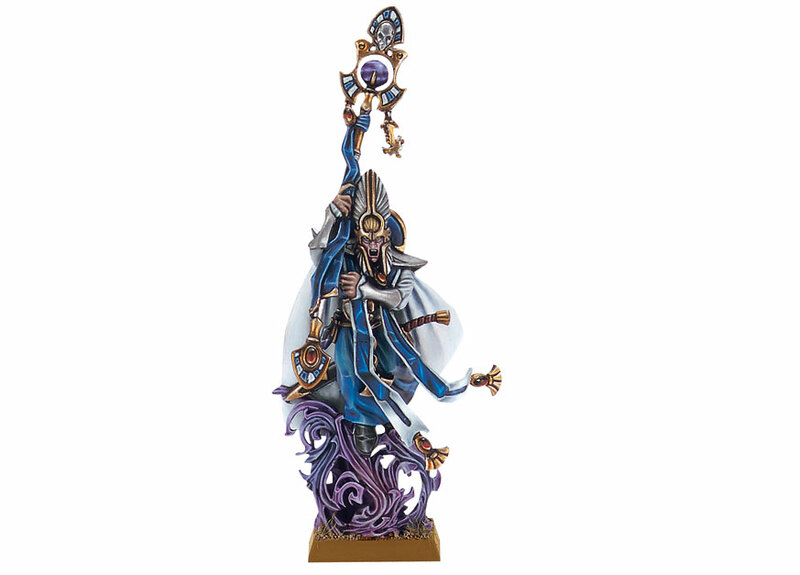 The level of detail on Ryogo’s character miniatures is astounding – notice how the stars on the Mage’s cloaks have a bright centre and opaque strands, much like real stars. And like his Empire army, Ryogo’s High Elf units all bear colourful banners. Ryogo has done a great job of making the High Elf Prince and his Dragon look like a single, united entity by using the same colour palate on both. 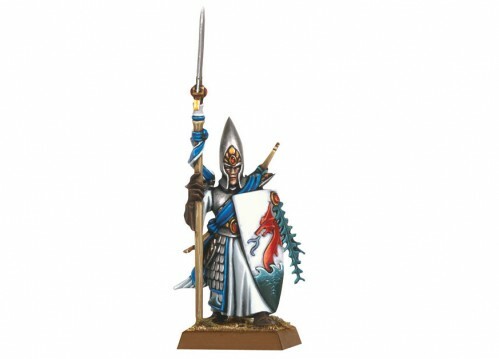 I particularly like the subtle use of orange on the Dragon’s armour and High Elf’s shield and helm. Great stuff Ryogo, thanks for sharing!